Your wedding ceremony is a moment that you will remember forever. Whether you envision an elegant outdoor wedding in our Wedding Garden surrounded by a stunning natural backdrop or an intimate indoor wedding ceremony to share your vows, we offer many beautiful and unique settings for your ceremony and wedding pictures. Our beautiful Wedding Garden is for couples who dream of a romantic outdoor wedding ceremony. A gently winding pathway leads you into the beautiful courtyard of the Wedding Garden where up to 250 of your closest friends and relatives will be seated. Nestled into a lush garden space of colourful blooms and green foliage, the Wedding Garden backs onto the tranquil pond providing a spectacular setting as you exchange your vows. 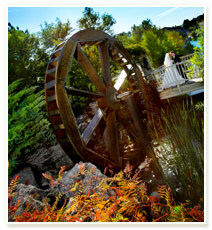 Natural greenery and water elements, including a working waterwheel, throughout the Wedding Garden offer an array of memorable settings for your wedding photography. For couples who envision walking down a pew lined aisle on their wedding day, our unique onsite wedding chapel offers an intimate space to exchange your vows. 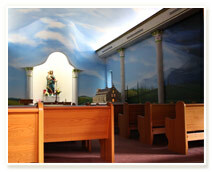 The perfect choice for a traditional wedding ceremony, the wedding chapel seats up to 80 guests. An indoor wedding ceremony is the perfect choice for couples who dream of a winter wedding or the exclusivity of a private indoor ceremony. 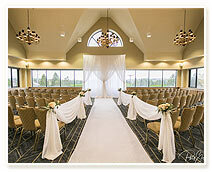 We offer many wedding ceremony room choices that can accommodate intimate gathers to grand affairs for up to 320 guests. From a cozy fire lit room, to the grand architectural details of the ballrooms, an indoor wedding provides a stunning backdrop for your wedding day.